Recently, Amazingy sent me some new products by Kjaer Weis. 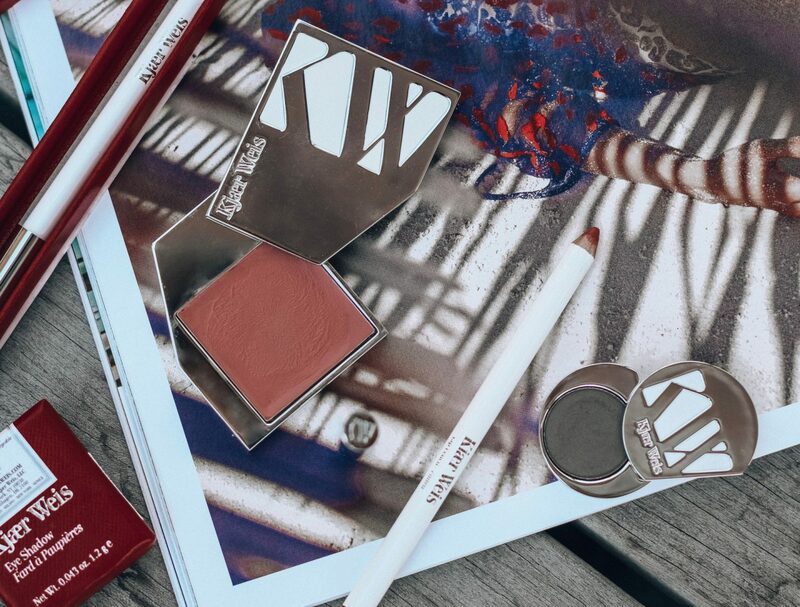 I’ve been using Kjaer Weis makeup products for a couple of years now. Their lipsticks and eyeshadows must have been one of the first nontoxic gems that made it into my makeup bag. For summer the brand brought out a couple of newer shades and when I held them in my hands, I simply knew they will go well with the rest of my makeup selection. Hence, I created this very summery makeup look for you. Honestly, it is very much my everyday makeup look simply enhanced by a change of products used. 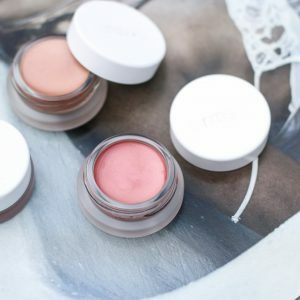 I was very impressed by the smoothness and easy application of the Kjaer Weis cream blush in the colour Reverence. It looks oh so natural applied to the cheeks and provides a subtle touch of colour. Equally as smooth and with an amazing colour payoff the lip pencil in the colour Faded got me all impressed. It looks incredible applied on its own but goes equally well and a little glossier topped with the Kjaer Weis lipstick in the colour Affection which I already owned. The blue and purple shades of the eye pencils look so stunning to me as well and I cannot wait to apply some eyeliner any time soon. In addition, the dark grey/brown eyeshadow shade called Generosity to me is the perfect shade to apply to the crease. I am so happy I received this colour since my RMS eyeshadow in the dark brown shade Tobacco Road is quite broken from falling down one too many times. Perfect timing for a replacement. 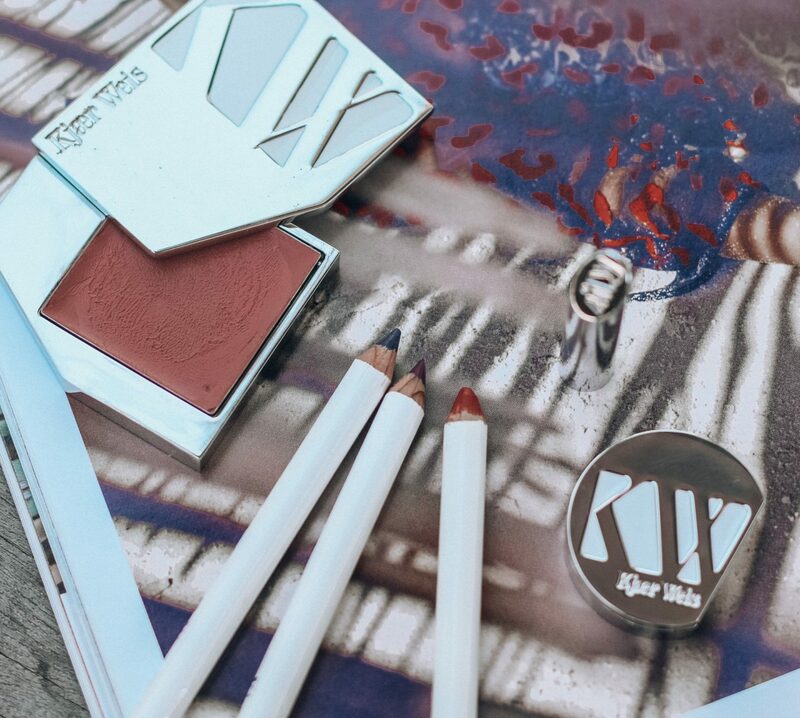 The eyeshadow by Kjaer Weis also applies very smoothly and is super easy to blend. Can you spot how pretty it looks and how beautifully it defines the shape of the eye? To achieve the ultimate summer face, I applied a thin layer of my Ilia True Skin Serum Foundation in the colour Texel. Next, I went in with the RMS “un” cover-up concealer to hide some impurities, conceal my eyebags and simultaneously to highlight the bridge of my nose and forehead so very lightly. To set the base I added a soft layer of the clear RMS “un” powder. I continued with applying the RMS contour bronze cream shade to contour my cheeks and nose by adding it to my jawline and to the sides of my nose. Every single one of those cream products I usually blend with my beauty blender sponge. It truly makes applying cream makeup products easier than anything. On my cheeks, I then applied the Kjaer Weis cream blush and highlighted the highest points of my cheeks as well as the bridge of my nose with the RMS Luminizer x Quad. Next, I defined my eyebrows with the Und Gretel eyebrow pencil in shade 1 and lined my waterline with the Und Gretel eyeliner in shade 2. For my eyes, I used the RMS powder eyeshadow in the colour Sunset Beach. I applied the colour to the entire eyelid. The Kjaer Weis powder eyeshadow in the colour Generosity got applied to my crease and underneath my eye. Now, I blended it all out. To finish the eye makeup, I added a layer of mascara. My favourite mascara of all time is the Voluminising Mascara by Green People. Lastly, to complete the look, I applied the Kjaer Weis lip pencil in the colour Faded. That’s all. I am keeping it very natural. Hence, minus the lipstick, this is basically my every day and every night makeup look. So, I wear this look on any and every occasion. Let’s just call it my signature look. You might want to try it yourself. I am sure you will love it equally as much.